We met our guide, Sao, the next morning, a young guy with a slight build of mainly muscle, a broad smile and a firm handshake. After leaving the things we wouldn’t need for the trek in the office, we went to pick up our Akha guide (whose name I’ve forgotten, though I never really had a firm grasp of it, being an esoteric connection between Ts and Zs) at a hill tribe village far more conveniently located by the side of the road than the one we’d be staying at. He was, it seemed at first, a man of few words. The idea was that Sao could speak English and Lao, while TZ could speak Lao and Akha so we’d all be able to communicate, even if it was a bit convoluted. Sao and TZ loaded up the car with an impressive amount of mysterious banana leaf parcels, fruit and vegetables, then we drove all of 50 metres from TZ’s village to the bottom of a trail that lead straight up a steep hill and disappeared into the trees. Oh, crap, I thought, looking up. No easing our way into it, then. We walked single file in the blazing sun, TZ up front followed by Alex, and then me, with Sao bringing up the rear. Between us, Alex and I were carrying our changes of clothes and my photo stuff while TZ carried half of everything else we’d need (food, water, sleeping bags etc) and Sao carried the other half in a rucksack that looked like it would fall apart any minute. After ten minutes, I still hadn’t reached the shade of the trees and was already exhausted. Sao tapped me on the shoulder to show me a sheaf of rice he’d picked from the paddy field beside us. “It’s almost ready for harvest,” he said. “Really?” I managed between deep breaths, brushing away the sweat stinging my eyes with what I hoped was cheerful nonchalance. “Yes, soon they will harvest everything,” he replied taking a grain and handing the rest to me. Unsure of what to do with it, I put it in my pocket, thinking of other questions about rice while I got my breath back. “Er, yes, okay.” The R/L thing is everywhere, it seems. In Malawi, Becky, the manager of Mango Drift on Likoma Island had told us that she’d only been able to get rice from the market by asking for lice. Once, I tried to say ‘hero’ in an Italian accent (can’t do the accent) and actually the letters can be made to sound almost the same. “Really?” we both said, doubtful. “True! Not quickly, five minutes maybe, but then crying stop. Okay, we go? First,” he gave us a chilli each, “for strong. Tzo-zo. Tzo-zo!” he shouted with a fist raised in the air. We munched our chillies. “Tzo-zo!” we replied, fists in the air. While we put our bags back on, Sao refolded the banana leaves and left them with the chopsticks on the side of the path in a neat, 100% biodegradable and environmentally friendly pile on the ground and off we went. The path wasn’t as steep after lunch, and then it went down a bit, then up for quite a long time. I felt like I’d got into a stride by now, which was probably the chilli. After a while and towards what turned out to be the top of a hill, the trees and bamboo gave way to open sky and views of all the hills around. Sao pointed out Muang Sing, way below us and completely covered by a big, grey cloud. “They’re wet in Muang Sing!” he said cheerfully. We carried on walking and the trail became harder to follow, hidden by encroaching plant growth, the muddy path pocked with rain-filled holes. My clothes were drenched in sweat and my bum and knees covered in mud from my various collisions with the ground. TZ hacked away with his huge knife to clear the path, gouging chunks out of trees along the way as markers for anyone else going the same way. Finally, we reached a point where we could see our campsite for the night; a hut surrounded by buffalo, perched on the top of a hill slightly smaller then the others. It looked so near but, cocking his head as he calculated, Sao estimated it to be two hours away. He was about right. 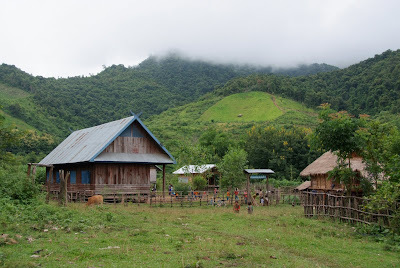 The hut was where members of a nearby hill tribe took turns, two at a time, to watch over the buffalo. I was expecting that we would sleep in tents but camping, in this case, meant sleeping in the little hut, all of us sharing the bamboo platform that served as a bed built at one side of the hut. At the opposite end, next to the door, Sao and TZ stoked a fire and began to prepare the evening meal (the things to do for our guides still not finished) and chatted with our new companions while Alex and I changed out of our sweat-drenched clothes, hanging them up above the fire, into new sets that I pretended weren’t slightly damp. With seven hours of walking and sweating behind us, we went outside to take in the view (and look for potential toilet locations, the best of which was over the brow of the hill simply because no-one would be able to see my naked bottom from the hut), listening to the soft clang of the buffalo’s bells and the sound of laughter wafting over from the hut. It was getting dark and grey and the hut glowed a cosy orange from the fire. For some reason, I’d lost my appetite and could only pick at my enormous serving of dinner, but when Sao emptied a little bag of red sauce with white bits onto a bit of banana leaf and encouraged us to try it, it returned. “It’s tofu,” he told us. I didn’t believe him. I hate tofu, with its tasteless, chewy, chickeny pretensions, the way it squeaks against my teeth and its smug, self-righteous claims about being ‘good for you’. But this stuff was both creamy and crumbly, breaking up a little into the rich, spicy, garlicky sauce, and actually tasted great, something, to my unrefined palette, like feta. Finally, a form of tofu I could get on board with. I was still dipping into it when the time came to finish the meal with swigs of Lao Lao, a potent rice whisky so good they named it twice, which left me with a warm, dreamy feeling that I hoped would help with the night’s sleep ahead. As we lay on our bed, the six of us side bide side, trying to align our spines between the bamboo stems, listening to the wind flapping the tarpaulin lining the sides of the hut, Alex whispered, “I’m never going to be able to sleep like this”. And he didn’t.